Internet and telephone traffic between Europe and the Middle East and Asia has been seriously disrupted since Friday when three major underwater data lines were cut in the Mediterranean, according to media reports. The main damage is to the four submarine cables running across the Mediterranean and through the Suez Canal. 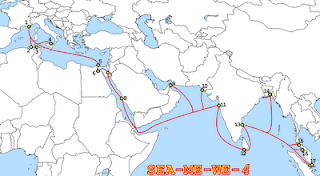 The damaged cables include Sea Me We 4 and Sea Me We 3 lines, which connect countries between Singapore and France as well as the Flag FEA cable route, which stretches from the U.K. to Japan, a France Telecom spokeswoman told Network World. A fault was also reported on the GO submarine cable 130km off Sicily. France Telecom isn't sure what caused the cut, she said. "We have two assumptions. The first is that it could be an underwater earthquake," she said. "Or it could be simply a ship in the area which has cut the cable." The BBC says that some seismic activity was reported near Malta, where the break apparently occurred, shortly before the cut was detected Friday morning. Ships dragging anchors are also known to have cut submarine cables in the past. The telecom company listed 14 countries affected by the current problem. The Maldives are 100 percent down, followed by India, which has 82 percent disruption. Qatar, Djibouti and the United Arab Emirates were the next most widely affected areas with about 70 percent service interrupted. Disruptions for Saudi Arabia, Egypt and Pakistan range from 51 percent to 55 percent. It should be noted that the Internet penetration in Pakistan is about 10% versus 5% Internet penetration in India, according to ITU. Pakistani blogger Masud Reza is reporting that PTCL ITI (Information Technology Infrastructure) is running at 25% reduced capacity. Internet users are experiencing high latency and a degraded service level resulting in extremely low speed on downloads. TW1 also has the same issue. TW1 (Tansworld 1) relies mainly on the SMW4 western segment. The impact of the cable cuts is being felt much more in India than its neighbors. For example, 82 percent of India's voice traffic capability to Europe was out of service early Friday, although that situation has now improved, according to reports. A maintenance boat is en route to the site of the cut, but it will not get there until Monday, and it will take as many as two weeks for the situation to return to normal, according to France Telecom. This is the second time this year that the Internet services have been disrupted in parts of the Middle East and Asia after damage to undersea cables in the Mediterranean. In January 2008, there was disruption to 70% of the nationwide network in Egypt, a government official told Reuters. There was also disruption in the United Arab Emirates (UAE), Kuwait and Saudi Arabia. India also suffered up to 60% disruption, a national industry body told Reuters news agency in January of this year. Pakistan was affected with TW1 customers suffering the most. PTCL switched its Internet traffic from SMW4 to SMW3. Jonathan Wright - director of wholesale products at Interoute which manages part of the optical fibre network - told the BBC that the effects of the break would be felt for many days. "This will grind economies to a halt for a short space of time," he told BBC "If you look at, say, local financial markets who trade with European and US markets, the speed at which they get live data will be compromised." "We've lost three out of four lines. If the fourth cable breaks, we're looking at a total blackout in the Middle East," said Mr Wright, according to BBC report. A second subsea cable to Malta is currently being laid. More redundancy, multiple routes and better undersea cable protection should be explored to prevent the continuing negative impact of the repeat damage to the undersea cables. I bet the ill-treated minorities and the poor in India do not have the luxury of knowing or caring about the Internet access. The Internet in India is for the privileged few who are part "India Shining", with one of lowest penetration of the Internet in the world (5% in India vs 10% in Pakistan, per ITU...http://www.internetworldstats.com/asia.htm). The rest are probably struggling and foraging for food to stay alive. Yeah I'm sure Jamat Ud Dawa is busy providing schools with internet access and kalashnikovs to poor people across Pakistan. Maybe you should do some reading about rural connectivity in India. You say, "Maybe you should do some reading about rural connectivity in India." Do you have data that disputes the ITU Internet penetration figures of 10% in Pakistan vs 5% in India? Your comment about Jamat-ud_dawa just shows your obsession and it is irrelevant for this discussion. You can do your own research - look up people like Ashok Jhunjhunwala, E Choupal, etc. Admittedly the penetration levels are low, but the future looks bright. Also dont take pride in petty facts like having greater internet access. Whats the point of surfing the net when you still need to beg the IMF for money? You say "define victory...declare victory..In case of Afghanistan...there is no definition..."
The Pentagon yesterday declared that 10 days of air strikes have "eviscerated" the ruling Taliban militia, as the United States greatly increased the number of troop-hunting fighter jets swarming over Afghanistan. In recounting the heaviest two days of bombing, officials disclosed that for the first time all four Navy carriers in the region took part in operations Monday. This included the USS Kitty Hawk, which an Army source said is carrying Army Special Forces soldiers and Black Hawk helicopters. You say "Also dont take pride in petty facts like having greater internet access. Whats the point of surfing the net when you still need to beg the IMF for money?" Pakistan faces many challenges, the economy being one of the most important ones. On the other hand, in terms of basic statistics of living standards such as poverty, hunger, etc , Pakistan is doing better than India. If I were you, I wouldn't be so careless as to write Pakistanis off. There is an interesting piece that William Dalrymple wrote comparing India and Pakistan on their 60th independence day, after visiting both nations. Please read it. No wonder, such a small percentage of Indians know how minorities are prosecuted, who killed Gandhi, why an honest police officers like Kirkerey was killed, why Hirsh Mandir needed to resign.... What to expect from these pseudo liberals.